Meditation apps, fitness apps, water intake apps, calorie count apps, menstrual cycle apps and, as of recently, journaling apps – all too popular, but the repercussions of data transparency online are rarely acknowledged. Becoming a journaling virtuoso has propagated as an on-trend goal across social media for a few years now, leaving anxious teens with a desire to write down ideas – the more controversial, the better – in a creative, visually pleasing and Instagram-worthy fashion. But what happens when not only metadata escapes one’s private space into the abyssal void that global databases have become, but also the most intimate thoughts? The figure that was once only vaguely contoured by a name, age and perchance favorite songs is now correlated to willingly provided data, preferences and personal daily life details. A “new algorithmic identity” (Cheney-Lippold 165) or an addition to an already existing one is attached to an individual through the collection of their data. Privacy is dismantled. “Types of machines are easily matched with each type of society […] because they express those social forms capable of generating them and using them.” (Deleuze 6) Prevalent social issues have become the starting point for developments across all fields. The founders of Reflectly have seen a gap in the market which could – but most importantly needed to – be filled by a simple but innovative concept which merges the ease of operating a mobile application with an almost empathetic, inviting “personality”. What sets Reflectly apart from other journaling apps already on the shelves of an overly saturated market is the artificial intelligence underlying it. The ingenious question-based structure leads to user generated data which is further handled to shape daily audio reflections tailored for the content users have provided as part of their answers – a feature that makes the app stand out among the plethora of available meditation programs. (Farmbrough) By the end of May 2018, the app had a solid and promising foundation, rendering equally professional cross-platform results as well as creative content. Therefore, journaling, like many other activities, has been translated into the virtual world while bringing along a set of changes in one’s perception and performance on-platform. The implications of Reflectly found at the design level are plentiful, as there is “no such things as a ‘neutral design’” (Thaler and Sunstein 3): enhancement of one’s freedom and directing of actions and thoughts by means of affordances and nudges, invitations to continuously engage and provide data through exclamations and interrogations while capturing the user in a “bubble” of perpetual use and augmented attention arrest. It is true that the data is of absolute necessity in order for Reflectly to supply a continuous flow of tailored information to its users and this is conditioned by a necessary trade-off of data between the two parties. Computers can only compute based on given input, therefore, “the less a system captures, the less functionality it can provide to its users” (Agre 749), thus making data collection a requirement. Aside from representing a new medium to express oneself, Reflectly is a distraction from real life where the user is constantly engaged and invited to respond, from the smiley face icon to the deeply personal questions he/she answers. The app is tapping into a “gamification” structure (Morozov 203) where “players” complete tasks to discover new reflections and unlock premium rewards that, in part, incentivize daily engagement, therefore more time spent on providing data which is collected and processed. Endless, looping momentum. Should journaling transcend the conventional ‘pen&paper’ into the virtual medium? Is it safe for not only metadata but great volumes of utterly personal data to pierce the complex textures of worldwide databases? Is total privacy a concept of the past? 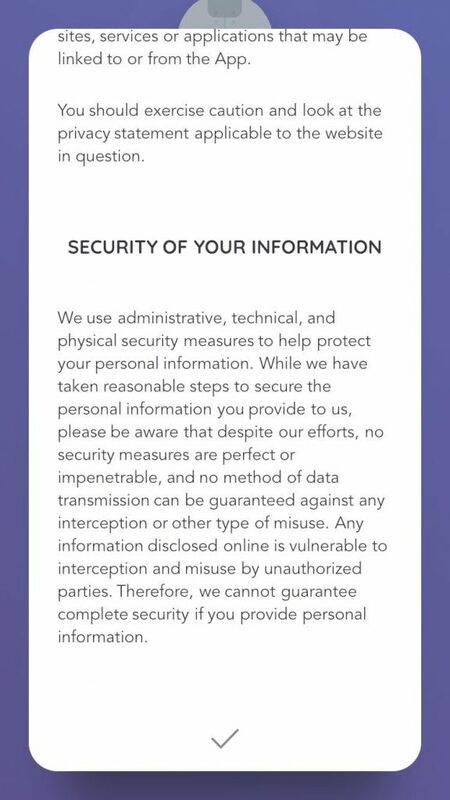 But most importantly, to what extent do users of such interfaces value their privacy, if at all, and where does their free will stand? If an arbitrary individual were to assertively demand “Can I read your diary?”, how would you respond? Agre, Philip E. “Surveillance and Capture. Two Models of Privacy.” Information Society, vol. 10, no. 2, 1994, pp. 101-127. Brøgger-Mikkelsen, Jakob. “Meet our new Start-Up: Reflectly.io.” Reflectly, 20 Jun. 2017, https://blog.reflectly.io/meet-our-new-start-up-reflectly-io-d8dd44c5097a. Accessed 21 Sept. 2018. Cheney-Lippold, John. “A New Algorithmic Identity: Soft Biopolitics and the Modulation of Control.” Theory, Culture & Society, vol. 28, no. 6, 2011, pp. 164-181. Deleuze, Gilles. Postscript on Societies of Control. 1992. Farmbrough, Heather. “Reflectly Wants To Be An Adidas Of The Mind.” Forbes, 1 May 2018, https://www.forbes.com/sites/heatherfarmbrough/2018/05/01/reflectly-wants-to-be-an-adidas-of-the-mind/#7fb902c04204. Accessed 21 Sept. 2018. Kitchin, Rob. The Data Revolution: Big Data, Open Data, Data Infrastructures and Their Consequences. 1st ed., SAGE Publications, 2014. Thaler, Richard H. and Cass R. Sunstein. Nudge: Improving Decisions About Health, Wealth, and Happiness. Yale University Press, 2008. Vestergaard, Daniel. “Reflectly – From React Native to Flutter.” Medium, 12 Jul. 2018, https://medium.com/reflectly-engineering/reflectly-from-react-native-to-flutter-2e3dffced2ea. Accessed 21 Sept. 2018. « Is Blockchain Technology on the Verge of Revolutionising Our Lives?